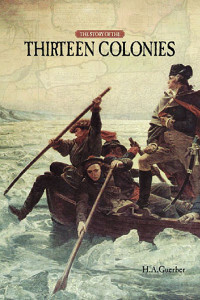 he Story of the Thirteen Colonies is a soft-bound 8-1/2×11 inch book of 240 pages. There are 84 chapters, with each chapter consisting of two to three pages of text. The cover art is taken from Washington Crossing the Delaware by Emmanuel Gottlieb Leutze, in the Metropolitan Museum of Art, New York City. The Story of the Thirteen Colonies opens by telling the story of the Native Americans who originally inhabited the North American continent, proceeding from there to the Era of Discovery by the Europeans and the settlement of each of the Thirteen Colonies. It ends with the history of the War for American Independence which concluded in 1783. This book, like all the others in Guerber’s history series, is meant for a child’s first introduction to the history of the era of discovery and exploration, and early America. It was written with fifth graders in mind, which is the age we recommend it is read (however, it still remains a child’s first introduction to history, no matter what age history study is begun). The volume can be read by fifth graders independently; it also remains very appropriate for a history read-aloud for any children in the elementary grades. Although we encourage everyone to use the Guerber histories, including The Story of the Thirteen Colonies, with their children in the elementary grades, we have heard from many parents whose teens read these histories with great enthusiasm. Do you have a question about The Story of the Thirteen Colonies? Please ask at info@nothingnewpress.com (and be entered into our weekly eBook giveaway).